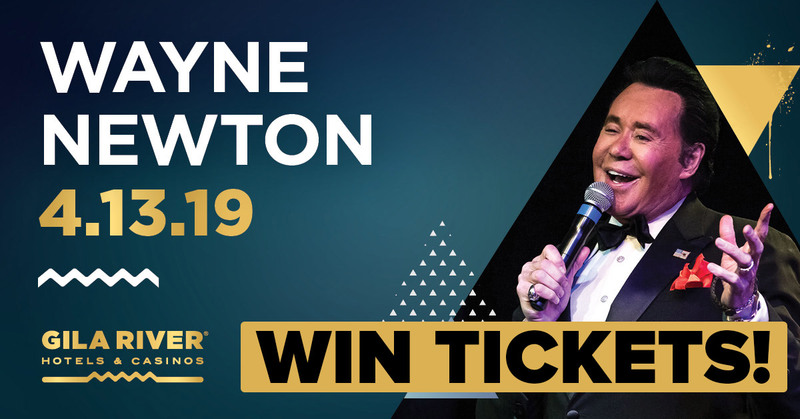 From now until April 11, 2019 enter daily for your chance to win a pair of tickets to see Wayne Newton in concert at Wild Horse Pass in Chandler, Arizona on April 13, 2019! • Enter each day during the Sweepstakes window (March 13th – April 11th, 2019) to increase your chances to win. 1x pair of tickets to see Wayne Newton in concert at Wild Horse Pass in Chandler, Arizona on Saturday, April 13th, 2019 at 7pm. Starting March 13th, 2019 at 8a, enter online until April 11th, 2019 at 11:59p at aztv.com/win for your chance to win. All winners (4 total) will be randomly selected by KAZT contest software. Winner is responsible for ensuring accurate contact information and will be notified via email or phone. Winner must claim their prize by 4:00pm on Friday, March 12, 2019 and must present photo identification. Any provided tickets are subject to certain terms and conditions specified thereon and the terms and conditions of the event venue. AZVT and its sponsors are not responsible for anything beyond delivery of prize. If concerts or other ticketed events have been awarded as part of this prize package and the concert or event is postponed, rained out, cancelled, or for other reasons beyond our control does not occur, AZTV and its sponsors will not be responsible for replacing that portion of the prize.